I need to create a series of threaded holes in an asm all the way trough one part of it. The thickness of this plate might vary in the near future, so I want my thread to be surface to surface. That doesn't seem to be an option. I can get 'to surface' for my drilled hole, not for my thread. 'Tru thread' is also not available for some reason. Usually I use an extrude if I have a large number of holes in one surface, and I add cosmetic threads, but these only go to M24x2, and for this I need M24x3. Never mind the text on the pic, was gonna send it to a colleague. I guess just with hole feature this is not possible. In case of a standard hole feature it won't let you add a relation to the depth of the thread. The reason is because depth of the thread can't go deeper than the hole itself. For that reason the thread depth only allows the numeric input within certain range, and restricts the use of a feature relation. Well, the meaning of feature relation would be to drive the depth with parameter from another feature, for instance the thickness of the plate. Your only option here is to use cosmetic threads. If you need a M24x3 thread specifically then you just have to add it to your *.hol file. You cannot use full thread with "depth until" option. Try a simple "Through All" and then pick full thread. Strangly, it is possible to have the thread go further then the hole. See pic below. The plate is currently 35 thick, put the drilled hole 'to surface', and I've set the thread to a depth of 41. Of course I don't want to go below the hole, just to the same surface. I don't understand why 'tru thread' doesn't work, it never seems available. How do I adjust the .hol file? I've found the file, opened it in notepad, but it's a very messy file on the inside, so I don't know how to deal with it. 'Through All' will cause problems elsewhere in my asm, and even with 'through all' I can't activate 'tru thread'. Don't know why. Try opening the *.hol file in Wordpad, might be less messy. There are few topics on the boards on how to deal with these files. Robbie, use a feature relation to set the thread length equal to the thickness of the part. You can do this while your inside the feature definition. 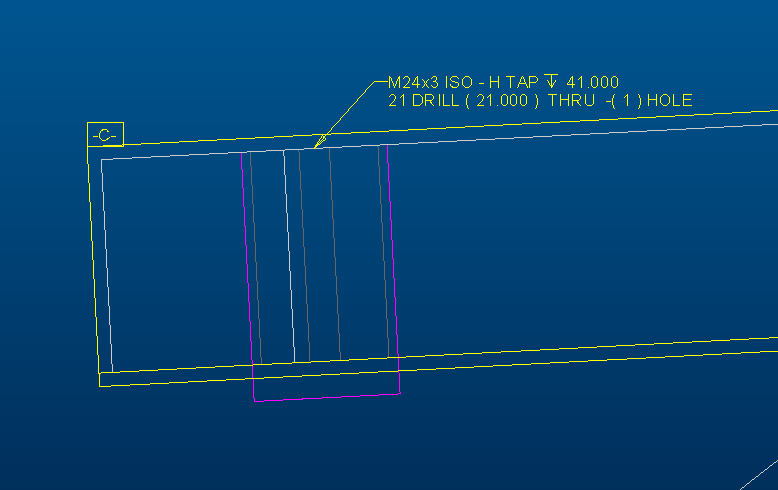 Use drill to selected surface option and pick surface. try selecting the thru feature option, you will have better luck. any option not filled in the shape box will cause the feature to seem to not work or fail. for giggles and grins, try putting a chamfer in too and see what the shape box allows you to do.